Recently, during the MAMA awards, he won the Best Male Artist, Best Vocal Performance (Male) and UnionPay Song of the Year for his song, “Eyes, Nose, Lips“. Taeyang who is also in the band, BIGBANG will be heading to Singapore in two weeks. He will be here with his band to perform for the SG50 countdown. Come February, he will be holding a solo concert for his fans. 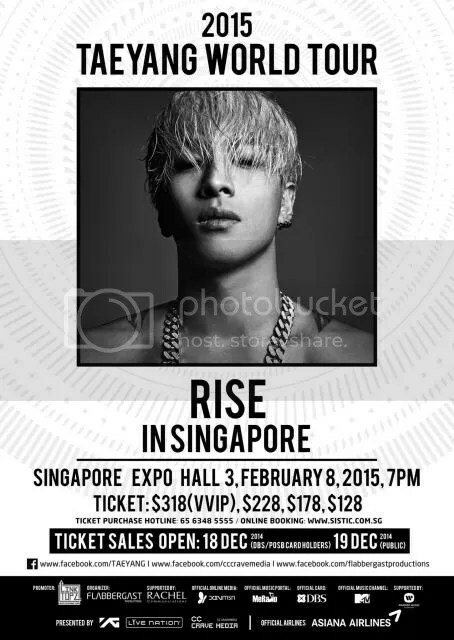 Thanks to Flabbergast Productions in collaborations with LinkTopz and CC CRAVE MEDIA (Korea), Taeyang will be performing at Singapore Expo Hall 3 on 8 February 2015 at 7 PM for a one-night-only performance. Be prepared to be swooned over by Taeyang. Tickets will start selling on December 19, Friday at all SISTIC Authorised Agents, SISTIC Hotline, SISTIC Mobile App and SISTIC Website from 10am onwards. If you are holding a DBS/POSB Credit/Debit Cards, you are in for a treat. You are just a day away from getting your hands on the tickets. Yes, you can purchase the tickets from SISTIC from 10am on December 18! Limited VVIP is available and all moshpit tickets will have queue number which is automatically generated by the system on a best available basis during the ticket sales transaction. If you are still undecided whether you should buy the ticket, you might change your mind after this video. Keep updated on the latest happenings of the upcoming concert by liking Flabbergast Production Facebook Page.